One of the study research sites at TasFACE, Tasmania. Credit Mark Hovenden. 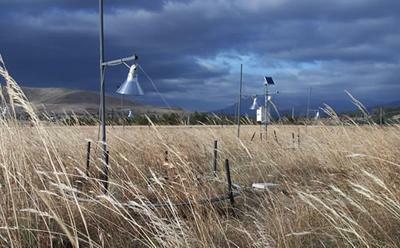 The indirect effects of rising atmospheric carbon dioxide (CO2) levels, such as changes in soil moisture and plant structure, can have a bigger impact on ecosystems than previously thought. Understanding the importance of these indirect effects, in comparison to the direct effects, will improve our understanding of how ecosystems respond to climate change. A study, involving researchers from the University of Southampton, found that water-limited ecosystems in arid and semi-arid regions, such as The Great Plains and South-West United States and some in Australia and Mediterranean Europe, were particularly impacted by these indirect effects. For those ecosystems, the importance of the indirect effects was as much as or in some cases, greater than, the direct effects. Rising CO2 levels affect a lot of plants directly by stimulating photosynthesis and reducing the loss of water (plant transpiration) by reducing the opening of the small pores in the leaves, known as ‘stomata’. This triggers several more subtle, indirect effects. For example, when plants close their stomata, they use less soil water, changing the amount of soil water available to other plants. At the same time, altered water availability and enhanced photosynthesis can change the amount of leaf, root and below ground microbial biomass, resulting in changes to ecosystem functioning. One of the research sites at TasFACE, Tasmania. Credit Mark Hovenden. 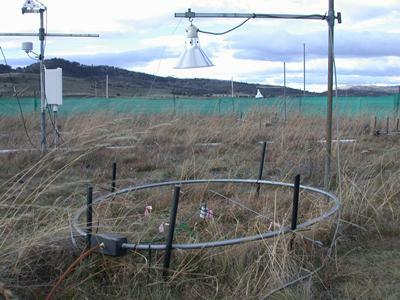 In the study, published in the Proceedings of the National Academy of Sciences (PNAS), the researchers found that these indirect effects explain, on average, 28 per cent of the total plant productivity response, and are almost equal to the size of direct effects on evapotranspiration (ET) - the sum of evaporation and plant transpiration from the land to the atmosphere. Using computer simulation, the researchers investigated the effects of elevated CO2 across a variety of ecosystems. They were able to specifically determine for which ecosystems and climatic conditions the indirect effects of elevated CO2 are of crucial importance. The simulations suggested that the indirect effects of increased CO2 on net primary productivity (how much carbon dioxide vegetation takes in during photosynthesis minus how much carbon dioxide the plants release during respiration) are large and variable, ranging from less than 10 per cent to more than 100 per cent of the size of direct effects. For ET, indirect effects were, on average, 65 per cent of the size of direct effects. Indirect effects tended to be considerably larger in water-limited ecosystems. The study was led by Dr Simone Fatichi (ETH Zurich -Switzerland), and involved researchers from Aukland University of Technology (NZ), the University of Southampton (UK), Duke University (US), Villanova University (US) and the University of Tasmania (AU).